Solitude is just like it sounds… secluded, serene, and typically blanketed in soft plentiful powder snow. Solitude’s 1,200 acres, located in Big Cottonwood Canyon just before Brighton, is great for families given the well planned pedestrian skiers village – with a European architectural flair. Solitude Village is like a European ski village, you can rent a convenient condo and walk to the slopes from Club Solitude, or stay in the Inn at Solitude – many rooms offer a deck and view of the slopes. Deer Valley and Solitude are now owned by Alterra – an Aspen 13 ski resort collection, part of the IKON pass, so we expect changes to Solitude – a previously quieter ski resort. Skiers and snowboarders will find express quads serving most of the 77 runs at Solitude, something for everyone. What you won’t find are lift lines or crowded lodges at Moonbeam or Mining Camp. There are plenty of groomers and wide boulevard trails like Main Street, Alta Bird and Sunshine Bowl, plus patrol gated chutes and glades in Honeycomb Canyon which is 400 acres of backcountry to explore off the 10,035-foot summit now serviced by a new Summit Quad. Kids love Solitude – they can track their runs and vertical online at day’s end with Solitude’s ticket scanner system. They will also love the outdoor heated pool. Parents will like Solitude’s 6 and under ski free, and the exceptional snowsports school. Solitude is super convenient as well, the Bavarian style base village has just enough restaurants and shops for a relaxing ski week – no need to drive, you can walk to everything. For après ski at Solitude, the Thirsty Squirrel is where the locals go. For a western style saloon dinner of steak and ribs, grab a shuttle to the Silver Fork restaurant down the road. Your family is sure to find solace (and Colorado snow) at Solitude. 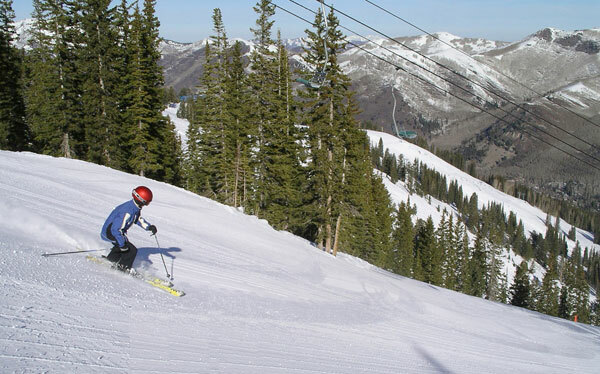 Its a Top 10 Utah Family Ski Resort.